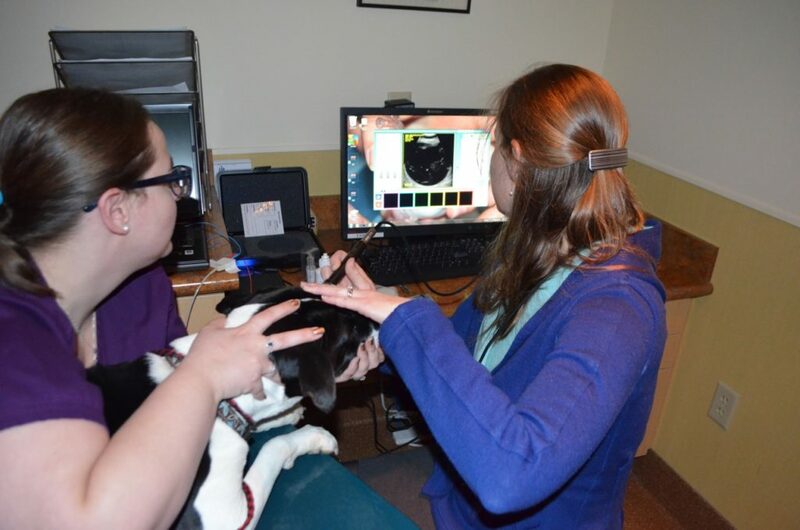 I took our new arrival, blind Millie, to our veterinary ophthalmologist in Burlington, Dr. Sarah Hoy, last Wednesday. 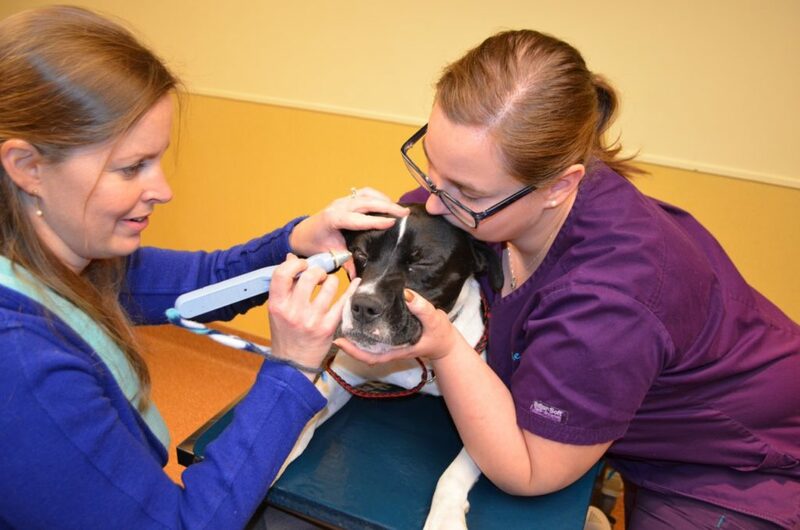 She removed Millie’s swollen eyes during surgery on Thursday morning. I took that photo above yesterday. Millie has recovered quickly and is already back to being her playful self. Dr. Hoy determined that Millie was born with cystic eyes. Wikipedia’s definition of this is: “Congenital cystic eye (also known as CCE or cystic eyeball) is an extremely rare ocular malformation where the eye fails to develop correctly in utero and is replaced by benign, fluid-filled tissue. Its incidence is unknown, due to the very small number of cases reported.” As you could see from the photos in the previous post, Millie’s corneas were also severely damaged and had become conical in shape. Dr. Hoy’s vet tech Ashlie is holding Millie, who was wonderfully calm and quiet during all of this! It’s the shiny roundish object inside the black globe. Millie had a smaller version of that in her right eye. This could be mineralization, or it could be a tumor. Dr. Hoy said she has seen dogs with cystic eyes develop tumors in the eye by 3 years of age, so it was best the eyes come out anyway. We sent the left eye?in to pathology to find out and we’ll get the results this week. Fortunately, Dr. Hoy said ocular tumors rarely spread outside the eye, so even if this turned out to be a cancerous growth, Millie should still be okay. 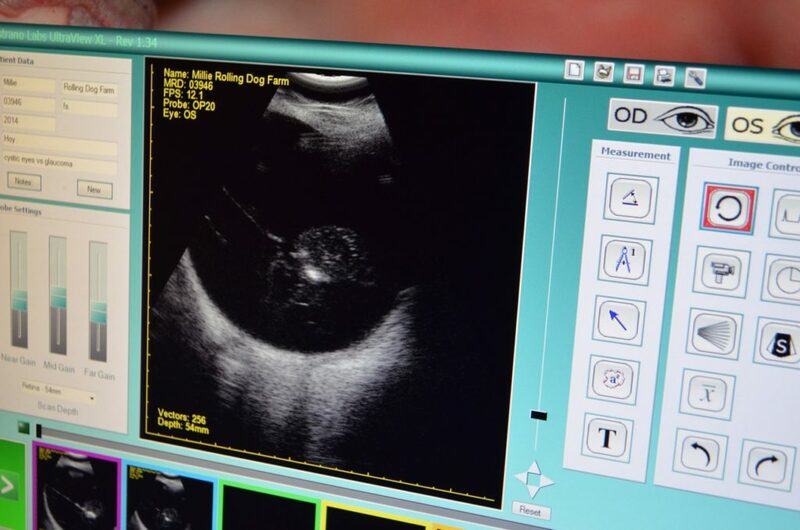 Dr. Hoy opened the right eye after removing it and found the smaller growth in that eye was indeed just mineralization. The left eye was the more suspicious one. Millie has been great about taking all of her meds, and in general has turned out to be a model patient! I know I said last week that I’d post photos of Millie playing with Tanner this week, but I figured this topic was more relevant … so next week you’ll get to see them in action. A new Shelter Challenge starts today, March 7, and runs until April 10. You can vote every day for us at the Shelter Challenge website. Thank you! Boy, she is such a trooper! Having just had surgery myself, I am awed by her patience and reliance on those she knows love her. Thank you so much and everyone around you for all your care for her!! Millie is truly lucky to wind up with you. Not only has she gotten a forever loving home with brothers and sisters plus a wonderful Mom & Dad but finally got the medical care she quite obviously was in desperate in need of. I’m so glad that Millie’s surgery went well. I think she deserves extra treats for being a good patient. That you for taking such good care of her. I’m also glad you have specialists nearby that you can rely on. My dachshund Heidi had both her eyes out two years ago after having uveitis in one and glaucoma in the other. I was brave enough to go through with it thanks to Widget and now she is pain free and happy, and I know Millie is too. Thank you RDF! It looks awful but we always do after surgery. The important thing is how she feels! Millie’s “eyes” will soon match her beautiful personality. You go little girl! 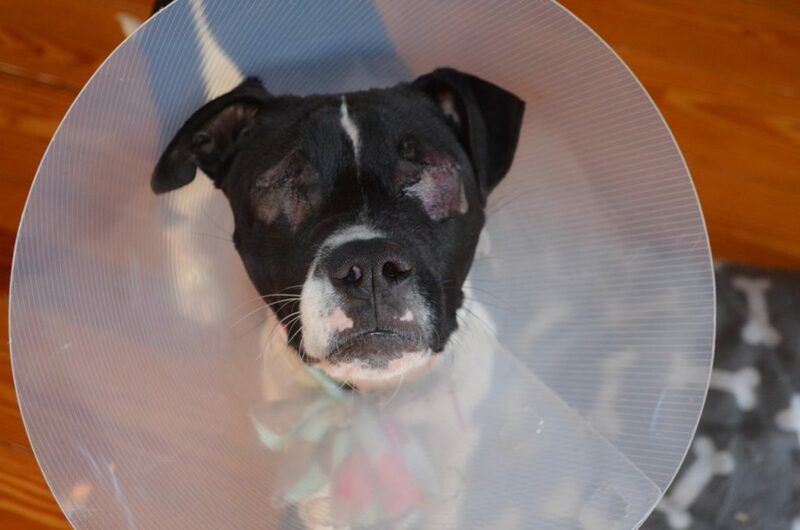 She is going to have a new lease on life–thank you Rolling Dog Farm. We adore and love your work. We can learn so much from these special fur kids. They roll with the punches…. and keep on with life.